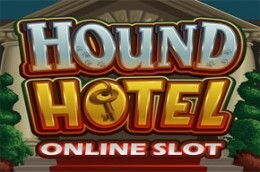 As the name already suggest it, Hound Hotel is an online video slot with a dog theme and related graphics and symbols. This game is a 5-reels slot with 3 rows and 25 fixed paylines and it was created by Microgaming software platform. Hound Hotel offers to its players stacked wilds, split wilds, super stacked wilds, expanding wilds, wild reels, super wild reels, and great prizes. The lower value symbols are represented by the standard playing cards (J, Q, K and A), while the higher value ones are 5 doggy characters. The wild symbol is the Hound Hotel logo and the scatter is the bellboy.